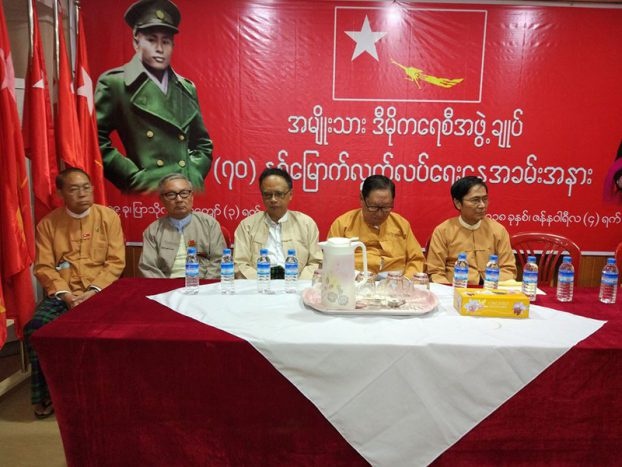 The statement was read out by one of the party’s spokespeople, Monywa Aung Shin, during a ceremony commemorating the 70th anniversary of Burma’s independence yesterday. The crisis in Rakhine State has proved to be the NLD’s biggest challenge on the international stage. Criticism of the government and security forces’ response to attacks by Rohingya militants on 25 August has come from the highest levels of the United Nations, as well as several Western countries. More than 650,000 Rohingya have fled to Bangladesh since August as Burmese security forces have carried out heavy-handed “clearance operations,” ostensibly as part of counterinsurgency efforts in the wake of the militants’ attacks. The UN human rights chief has described the operations as a “textbook example of ethnic cleansing” amid numerous accounts of grave human rights violations allegedly perpetrated by government security forces, though Burma denies that any widespread misconduct has taken place. Addressing the state of the nation more broadly, the NLD’s Independence Day message said measures to foster peaceful coexistence between different ethnic groups and rehabilitation efforts had restored Burma’s conflict-stricken areas to normalcy and further steered the country along the road toward development. Thursday’s commemoration ceremony organised by the NLD was also attended by members of the 88 Generation, lawmakers and ambassadors.